There is something about having your hair all pulled up that is so effortlessly chic... every girl can wear it with confidence. High buns, by far, are the quickest go-to for last-minute styling. 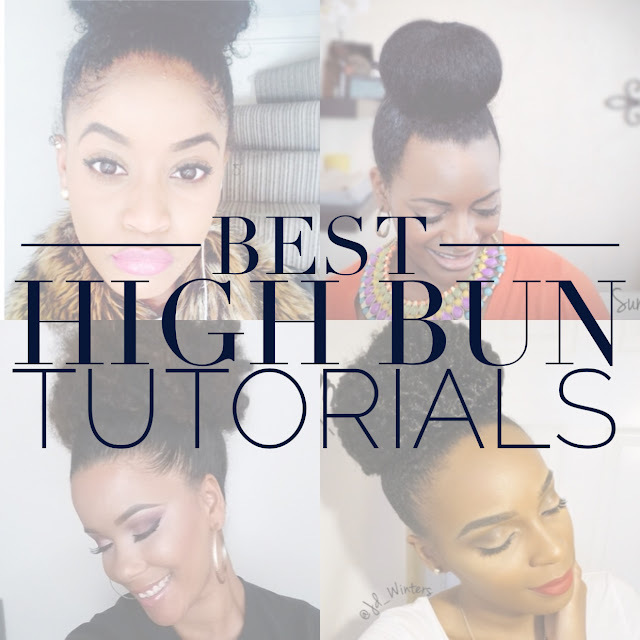 If you haven’t quite mastered the high bun, check out some of the best natural hair high bun tutorials I’ve come across, which cover a variety of textures and lengths. 1. Up first is a tutorial by Sumetra Reed with a soft braided high bun. This style is great for relaxed or natural hair. Her tutorials are the best! 2. Don’t have enough hair for a bun yet? This tutorial by Jasmine Winters has all the steps covered. Maybe I’m late but I was just let in on the faux high bun style with Marley hair a few months ago and I’m in love! Can’t wait to try myself. 3. If you are not ready to add Marley hair to your puff, this video by YouTube Channel All That Ishh shows how to fake a bigger puff/bun by separating the hair in two sections. Very smart and easy to accomplish for short to medium hair as well. 4. Finally, if you have very long hair I adore this 5 minute lazy girl high bun by Ahfro Baang. It’s also something cute to try if you are wearing a sew-in protective style and need a last-minute fix for your hair. Which style of high bun is your favorite? Let me know!